Intensifying homelessness crises have been feeding major conversations in Greater Victoria, as they have more and more elsewhere in Canada. Angry social and news media debates swing from the cruelties of housing displacement to tent cities as health and safety disasters back to unaffordable housing. Every now and then, cogent dialogue emerges about how homeless communities can fill gaps in harm reduction and housing services, or about how various levels of government could address the expanding homelessness emergency. Greater Victoria’s latest version of this dichotomous tale started in the spring of 2018 when tents began colonizing a green space in a Saanich neighbourhood known as Regina Park. It wasn’t long before approximately 100 campers were inhabiting the park, where they remained for several months. A municipal court eventually ordered the park to be emptied of campers in early September. Nearly half the park’s residents moved on to Rudd Park, then Ravine Way before approximately 30 tenters settled in at Goldstream Provincial Park’s nationally-renowned campground in Langford. (A sizeable police presence facilitated this movement over the course of a week, to some controversy.) Expressing a concern for safety, the provincial environment ministry closed the campground to the public and told all registered guests to leave by 11 am the next day. There was a backlash, so the province extended and then lifted the deadline before announcing that remaining campers will be transitioned to housing shelters on October 2, a timeline which B.C. Premier John Horgan identified to be in line with Goldstream’s normal two-week camping limitation. There is obviously considerable detail, civil activity and expressed emotion missing from the above summary of a much bigger story that began in Regina Park (nor did this story end after Goldstream). Various moral philosophies have fuelled arguments on all sides of Canada’s growing homelessness crisis. This essay does not directly engage these arguments, nor does it dwell on the topic of homelessness. The intent here is to discuss how a Community of Practice (CoP) can engage in a living and learning process of storytelling that doubles as an approach to informing community planning and development. Regina Park serves a working example of a complex community safety crisis to help describe a different kind of story — one that didn’t exist for the park or its surrounding neighbourhood. Creating safe communities is the entire purpose of CPTED (Crime Prevention Through Environmental Design), yet establishing a CPTED Community of Practice has been a difficult undertaking for many communities for a few fundamental reasons. Primarily, CPTED has been left without a champion. Most communities are unaware of CPTED or its full potential let alone mechanisms to enable the practice via self-organization and funding. This essay discusses a creative process in order to equip communities with strategies for self-organization. Funding essentials will be left for a future essay, but to give you an idea, outside of government dollars of some sort, Full Spectrum CPTED’s answer involves Community Development Corporations (CDCs). The creative process described by this essay is a dynamic form of storytelling that acts a mechanism to guide communities in the practice of CPTED. Yet as the title implies, this story has a process. While there really is no one-size-fits-all formula for a community story, there are many helpful methodologies to help establish focus. This essay will discuss a few of these methodologies, including what is a community of practice. First, however, we will start with how storytelling itself can be helpful to a community of practice. Storytelling is a powerful tool to inspire communities to get to know each other, and begin to recognize the stakes they all share in the face of change. While a community story often begins with a contentious issue that has the potential to negatively impact community harmony, a community of practice doesn’t need a dramatic issue to come together other than a shared desire to influence the future of their community. That said, it is helpful for storytelling to begin with a situation that involves a particular place or group of people undergoing some sort of experience that is worth exploring. Storytelling begins with discovering the full history of the people and places of concern in our community. Identify everything that contributes to where a situation is today: all challenges, successes, and failures; how a situation is impacted at its margins; and motivations behind all original goals of projects that may have already tried to deal with a problematic issue. By organizing such details into a coherent chain of conditions and events, we create a simple narrative about our shared community experience to relate to others who are difficult to directly involve in our community of practice — friends, colleagues, authorities and other stakeholders. Yet the ultimate point of the story is to inspire the community of practice itself as a long-term, living and learning entity capable of nourishing its participants as they come and go. Crucial to the questions upon which we build our story is understanding some fundamental dynamics at work in our community: social conditions that contribute to health inequality; the stakeholders who influence our story; and the community assets create the future(s) we envision. These elements ultimately help us flesh out our story’s “plot” and are all discussed in further detail below. Compiling this information into a story within a context of CPTED practice gives us powerful means to consolidate CPTED principles into our knowledge. To be clear, the purpose of this storytelling approach is NOT to facilitate construction of a particular agenda, nor even a consensus for environmental design. A shared practice of storytelling helps break down barriers to community relationships and build trust. Stories demonstrate how many possibilities are simultaneously conceivable, eliminating our perceived need for consensus for a single answer. Narratives are what organize people’s thoughts, and the only thing strong enough to change a dominant narrative is one that is more powerful. Stories also generate collective awareness, perceptions and wisdom, generating a greater sense of collective safety in the face of unfamiliar elements emerging in our community. A major narrative for our community of practice to tackle is about our own independence. It’s difficult, because we are taught to work for and value our independence; we kind of want to avoid having to count on our neighbours. But many of us take this responsibility for ourselves too far, contributing to social polarization. It may seem like a contradiction, but we increase our individual independence by learning to depend on each other, at least to an extent. From a biological perspective on this planet, for example, interdependence is a fact, not a preference. While we certainly have government and other mechanisms to mediate this interdependence, no system is perfect, and they can often break down. Completely resisting our dependence on anything often feeds perceptions of fear, not safety. Isolation really is the killer, and we often misunderstand the emotional forces behind it. For example, in the realm of CPTED, it is helpful to differentiate between the concepts of protection and safety. Protection means we are already fearful of something: it is a defensive action made against the potential of danger. Ironically, overly protective measures such as encasing ourselves in a fortress effectively creates the danger we’re afraid of, even when it doesn’t exist. Safety, on the other hand, is what empowers true independence: the ability to expand our minds and hearts by learning and exploring the world around us. But it’s not always easy to know the difference between safety and protection, because sometimes protective measures are required to ensure safety, such as building a strong foundation for our house or wearing protective gear during sports. A good way to recognize if our actions come from a place of safety or from a place of (over) protection is to analyse our own motivations: are we trying to isolate ourselves against something we don’t truly understand, or are we seeking to gain knowledge, wisdom or skill? If our goal is the latter, are we neglecting or hurting anyone in the process? These can be difficult questions, but if we’re going to expect others to acknowledge the hard truths about themselves, it’s only reasonable that we all do the same. The first concerns health equality, or equally health inequality. It is becoming more and more accepted that the most important factors that determine people’s health are social. Given CPTED’s inherently social nature, it follows that its practice should embrace a responsiveness for social determinants of health — the conditions in which people are born, grow, live, work and age. Examples include education, employment, social exclusion, gender, physical environment, traffic, recreation services, health program governance — the lens informing what counts as a social health determinant can be as broad as necessary. The point here, however, is not to bog ourselves down with excessive detail, but to shed light on the relevant patterns of behaviour that keep our story honest. There are plenty of resources available to spark brainwaves on social determinants of health. For example, the Canadian Council on Social Determinants of Health is a collaborative, multi-sectoral stakeholder group working to influence the factors that shape health and wellbeing. The Public Health Agency of Canada also has a portal to loads of information including data, strategy frameworks, action plans, guidance and research. Health Impact Assessments (HIA) offer a formalized way to gather and present health-related data to identify trends and patterns. It’s important to remember, however, that while helpful, formal data does not speak to people’s experiences in coping with vulnerabilities and isolation, and so should not replace direct interaction with community members. Health, of course, relates directly to safety, and injects our stories with a compassionate eye. For a CPTED community of practice, health-based frameworks enable a neutral understanding of community challenges and vulnerabilities. This calms much of the emotional fire fuelling differences in our attitudinal perspectives, enhancing our story’s accessibility to others. Health-based frameworks help satisfy the critics. Also known as Asset-Based Community Development (ABCD), the concept of asset-based planning is simple: everyone has a unique gift to give. Communities are strengthened by mobilizing people’s talents and passions — in other words, their assets. Meanwhile, the mere act of perceiving a weakness reinforces its status as a weakness. Communities that strictly focus on plugging needs as social deficiencies — deficiencies that are usually consigned to the margins of society — will never see those social deficiencies go away. Again, there are tonnes of great resources out there on asset-based planning, including strategies for asset mapping and community assessments. Many of these strategies draw wisdom from methodologies originally developed by John McKnight and John Kretzmann in the early 1990s. To be clear, asset-based planning does not suggest communities are allowed to neglect social needs or only worry about what already stands out as strong. Discovering and enhancing people’s strengths and gifts can often take care of needs as a simultaneous byproduct. Similar to social determinants of health, the sky’s the limit on what we can identify as a community asset. That said, categorizing assets helps to ensure we cover our bases. As an example, the engaged scholarship program at the University of Memphis lists four types of people-based assets: human, social, political and financial; and three types of place-based assets: cultural, built and natural. Importantly, place-based assets will also have people associated with them, broadening our story’s actor and asset base even further. This is a good thing, because identifying stakeholders is just as important as identifying assets. Involving the right stakeholders in our community of practice is crucial, and comprehensive asset mapping can be really helpful in pointing out our necessary stakeholders. While seemingly mere supporting characters, all stakeholders possess unique versions of our community story that cannot be ignored. For example, those involved in the maintenance and stewardship of community assets could have very different perspectives about those assets than those who use them. Stakeholders are also themselves assets, so it’s necessary to leave the scope of our story open for possible transformation by stakeholder input. Place-based assets also help describe our story’s environmental setting. This fits well with CPTED, which often starts with a particular geographic location experiencing elevated levels of crime, although it could also be any location that is due for physical regeneration through renovation or new-build construction. Considering how CPTED fundamentally assesses location in terms of broader community safety, asset-based planning is an outstanding tool to support CPTED. After all, CPTED is all about enhancing (and sometimes clarifying) people’s relationship with their environment and the other people in that environment. Either way, geographic locations have powerful influence over a community’s future experience, a fact that explains why communities can become so agitated when built development projects introduce unfamiliar change. Finally, the reason we refer to this activity as asset-based planning as opposed to asset-based development is because planning represents the social mechanism for self-organization, which is a prerequisite to development processes. This is where many urban planners can become confused, because the point of planning here is not the plan itself, but the activity of planning, which strengthens the multi-stakeholder relationships involved. Conflict resolution expert Adam Kahane uses storytelling as a key strategy to guiding diverse groups of stakeholders through tough problems together. He’s written several books and given several talks about his experiences helping people with national-level crises and lead social change. Kahane clarifies that the point of planning is not to write a plan down and then follow it, but to engage in a disciplined thought process together so we can adapt our actions and change our plan when circumstances make it necessary. How often do we see people putting huge amounts of effort into a thoughtful plan only to quit in frustrated disillusionment when that plan fails the second it encounters reality? Such abandonment is a tragic thing, because the thoughtful, collaborative effort that went into developing the plan still serves a crucial purpose: collectively, people remain far more informed after engaging in the disciplined thought process of planning than before they convened in the first place. When people skip the relationship work and attempt to build a plan in isolation of others, the shared learning required to put the plan to action does not occur. In such cases, we may as well call solo planning what it is: a surprise, which not everyone enjoys. And when people try to force such designs on others, they risk setting in motion feelings of fear and isolation, compelling protection without true safety. While Regina Park eventually serviced a version of community wealth, it was obviously not the kind of wealth residents of the nearby neighbourhood had in mind. 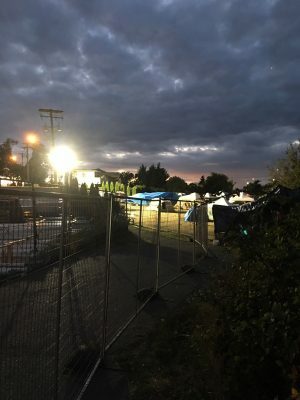 In June, about a month after tents began emerging in the park, Saanich city council held a public meeting to facilitate dialogue over the situation. Neighbourhood residents expressed fears over personal safety, noting theft, hygiene and drug violations and other privacy disturbances. Campers, outreach workers and supporting activists asked for compassion and for residents to get to know the people living in the park. Overall, the meeting served more as a media spectacle for opposing arguments than as constructive dialogue between them. A few neighbourhood residents who were interested in direct dialogue with Regina Park inhabitants sought resources to facilitate such a conversation. Unfortunately, neither the police, the city nor the province had a budget or process for such a mechanism. While campers eventually found some pro-bono legal and facilitation services for their own needs, neighbourhood residents had no method to talk to each other let alone bridge the divide to communicate with inhabitants of the park. In case you hadn’t guessed, a local community of practice of CPTED could have potentially enabled such dialogue. All such a practice ultimately requires is a diverse group of champions open to discovering their encompassing story. As a participatory approach, a CPTED CoP must involve a broad spectrum of stakeholders. A difficult reality here is that no one person can be the hero (or, conversely, every person is the hero). Individual CoP participants are ultimately part of many other life stories from which they need to act. No one should be expected to set aside these other important stories, because doing so creates their own barrier to participation. Our stories feed our values, which in turn feed our relationships — and remember — relationships are the point of a community of practice. So the goal, really, is to discover our collective set of underlying values, and draw on them to inform the rich asset and character bases of our community story. People’s other life stories, even when we allow space for them, still represent barriers to full participation. We all have lives, and nobody can do everything. It’s better to prepare for this reality up front, otherwise our CoP will fall apart as soon as key leadership needs to move on. As such, the leadership of our community of practice has to be flexible and share the power with everyone willing to accept it. This is why we tend to talk about champions as opposed to leaders, because when we try to identify our leaders, we often end up pointing to people who are already busy acting as leaders in other organizations. As we explained in our last essay, such leaders tend to not have the capacity to be the drivers of a practice that is not implicitly theirs. It’s important to realize that when it comes to inspiring a community story, everyone is a leader, because everyone is a champion. People will come and go, and the success of a community of practice depends on its ability to create a champion out of everyone along the way. This all highlights the transdisciplinarity of the CPTED CoP: the people and professions involved must transcend individual disciplines and create a new holistic approach. Tim Crowe, a contemporary CPTED godfather who passed away in 2009, even recognized this. Crowe’s fantastic book on CPTED (2000) remains foundational to students of the practice to this day. However, it is uncertain how much attention CPTED training courses give to what Crowe notes as its greatest challenge: the simple act of coming together to identify our shared concerns, passions and interests, and to plan ahead. As Crowe candidly joked: “Many agencies and professions learn to stick to their own bailiwick and avoid direct conflict. At least in direct conflict, they are still talking, albeit somewhat loudly. It is not until someone is able to cross over the disciplines that common interests are found” (2000, p. 3). Beyond mere discomfort with conflict, perceptions around risk management appear to present practical reasons for people to remain in silos. When we can clearly identify who is responsible for what, we figure we know who to point the finger to (or at) when stuff seems to go off the rails. But to what end? So insurance companies and lawyers can say who’s liable for life’s mishaps? People are realizing the world is far too complex for any one thing to remain squarely on one person’s shoulders or in one organization’s wheelhouse. And by partitioning risk into silos, people are compelled to become defensive about the bit that’s in their corner, losing sense of how their responsibilities connect to the greater system. This loss of shared awareness increases our shared risk. The worst thing about silos is they make system change a very long and lonely journey. This is the heart of our storytelling community of practice: ask questions together, look for honest answers together, and together, create a plan and be prepared to change it. Like Tim Crowe would say, question everything, and seek understanding from people who know something about what we’re looking for. And to reiterate, this is truly the point of planning: to build on the inherently social nature of learning by engaging in a disciplined thought process together. SO… HOW DOES A CoP CREATE SOCIAL CHANGE AND REDUCE CRIME? This essay has covered a lot of ground, but with all of its focus on building solid relationships, some may wonder how a community of practice creates change outside of itself. After all, a community of practice could be twenty people, two hundred people, or two people. In the grand scheme of things, these are all small numbers. The greater community, on the other hand, can be very large. One answer to this question is that any new relationship represents the change that we want to see: breaking down the organizational patterns that drive social polarization, isolation and conflict. For every individual who feels safe enough to connect with people they would not normally connect with, not only have they experienced personal change, but they have impacted a community greater than themselves. But if all possible, of course we want a community of practice to have influence outside of itself. For communities that want to intentionally grow a community of practice and have evidence of its success, there are more and more tools out there that help measure social change. But we need to remember that the point of social change is the change itself, not the measurement. It’s is up to the community of practice to challenge each other to bring their skills to other social groups in their lives, such as their friends, family and to their work. Furthermore, if new connections are created with people at risk of vulnerability and isolation, on some scale the likelihood of crime has been reduced. Finally, a community of practice must not be afraid to act. We need to experiment with pilot projects and versions of scenarios from the stories we develop. Even if a venture isn’t guaranteed to work, or not everyone fully agrees with the attempt, experiments are more powerful than words. Relationships are built far more on the experience of trying new things than they are on just talk. And really, what greater inspiration is there that change is possible than seeing a story we’ve created brought to life. Crowe, Tim (2000). Crime Prevention Through Environmental Design [Second Edition]. National Crime Prevention Institute. Lave, Jean; Wenger, Etienne (1991). Situated Learning: Legitimate Peripheral Participation. Cambridge: Cambridge University Press. Wenger, Etienne (1998). 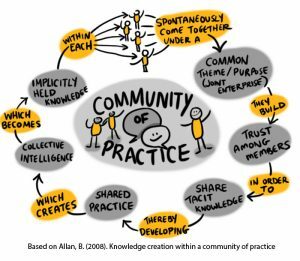 Communities of Practice: Learning, Meaning, and Identity. Cambridge: Cambridge University Press.